You want to record all keyboard keystrokes on your computer? You want to save them in a log file in the background? Maybe you want to spy the keyboard when someone else uses your Mac? You want to save all what you typed on your keyboard as a real time backup and eventually for later retrieval? Then Keyboard Spy is what you need! 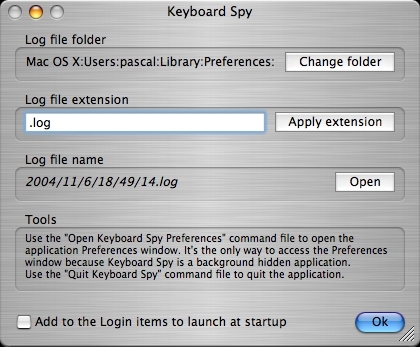 Keyboard Spy allows you to spy and record all your keyboard keystrokes in a log file in the background. – It records all keyboard keystrokes on your computer (excepted the passwords protected by Mac OS X itself). – It is an invisible background application that does not appear in the Dock. – It saves all your keystrokes in a log file in real time. – It saves the applications switching. – It doesn’t need any installation which makes it very easy to use. – It is available in Dutch, English, French, German, Hungarian, Italian, Japanese, Latvian, Polish, Russian, Spanish, Turkish and many other languages.